Contained within the stories of fairy tales and myth are universal themes common to all humanity. Welcome to my next story, and thank you for all your encouraging comments. 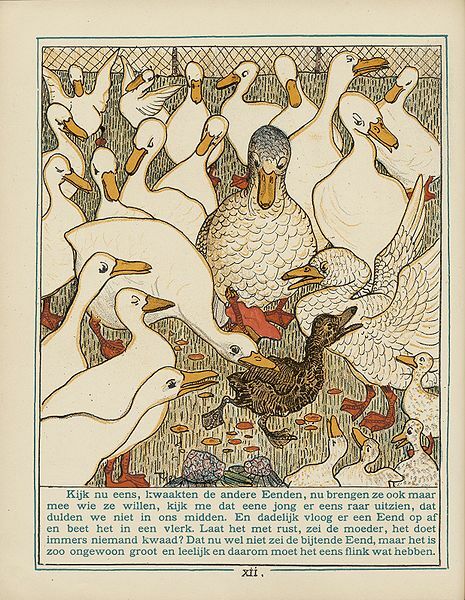 Written by Hans Christian Andersen in 1845, The Ugly Duckling is one of my favourite stories. It appealed to me as a sensitive child who always felt different (to the point that my name starts with P and the rest of my family all started with J! ). I love Clarissa Pinkola Estes' book Women Who Run With the Wolves, and my Process Questions this time are compiled from her commentary. I also love to hear Danny Kaye's song about the ugly duckling. "Hans Christian Andersen wrote dozens of stories about the orphan archetype. He was a premier advocate of the lost and neglected child and he strongly supported searching for and finding one's own kind" (Estes). The duckling represents that fighting spirit, that will to live, that is present in all of us, and is vulnerable to attack - I'm thinking of bullying, at school or in the workplace - but which can be nurtured and honoured by mixing with the 'right' people, our own mob. Stork: Harbinger of spring, it keeps the snake and insect populations in check, and is said to bring prosperity, fertility and happiness. Many cultures have different symbology of the stork. Burdock: Used for centuries for healing all sorts of ailments and sometimes cultivated as a vegetable, this plant grows to 1metre (3-4 feet) in Europe and Japan. Green good for the eyes: the colour green is said to be associated with life and death, hope as well as evil (‘green with envy’). It also connotes naivety as in ‘green-horn’. Do you think this is the whole world? : Some people never venture further than “the parson’s field” in life, others travel far and wide – in their imaginations if not otherwise. “See children, that is the way of the world”: This connotes socialisation of patriarchal hierarchy, and of status and discrimination (as in choosing the best). Turkey: the one in the story is puffed up with pride, but there are several other meanings in different cultures, including a perjorative term for a stupid or inept person, or something completely unsuccessful (as in the saying,”How can I soar like an eagle when I have to work with turkeys like you!”). Swamp: A place of shallow water, difficult to move through, it reminds me of “Eeyore’s Gloomy Place, rather boggy and sad”, from Winnie the Pooh. Nevertheless, it offers shelter. Two wild ganders: a distraction into territory the duckling is not ready for. Hunters: Potential destruction, environmental dangers. Old lady, cat and hen: Physical shelter and nourishment, but they all had unrealistic expectations of him. However, finding his own values helps him move on. Lake: Open water! In his element, where he can float and dive. Autumn and winter: survival mode. Swans: Source of the duckling’s yearning, a kind of role model for him to aspire to. A stirring of instinctual resonance. Farmer: Rescued from freezing to death, but the duckling cannot stay in the chaos of the farmer’s family. Spring at last! Newness, potential, possibilities, celebration of survival. Mirror of the water: Self recognition, and acknowledgement from his tribe bring a sense of belonging. Anthony Stevens: Ariadne’s Clue: A Guide to the Symbols of Humankind. 1998. A. A. Milne: Winnie the Pooh. What do you think is the archetype or universal theme of this story? How did you feel growing up in your family? Did you feel the odd one out, like you were in exile? That you didn’t quite fit? What about other families you know? One perhaps where everyone was sporty except for one musician…..
How have you parented the one in your brood who is a bit different? Have there been times when you have listened to the old duck against your better judgment – or held out and felt vindicated? What thoughts and feelings do you have about the ‘scoundrel father’? How long do we fight our children’s battles for them? Did you ever feel like running away as a child? How do you look back now on that episode? Did a child of yours run away? Is there a family member you wish would go away?How do you feel about that? Do you choose your friends or do they choose you? “What good are you if you can’t….? What value do you put on yourself? Do you follow the crowd or stand out? How is that for you? Where do you best like to be? Have you ever felt beside yourself with longing? What do you do with longings? What about times when you have been ‘frozen in’? The ugly duckling was rescued by a kind farmer. Have you been rescued? How did you feel – grateful , guilty, thanks but no thanks? How about your ‘winter of the soul’? Are you and your ‘wild nature’ holding out for spring? And when spring came? Can you look back on that time with equanimity, or are you still waiting for spring? How sharp is your inner critic? How confident are you when meeting new people? How important is it for you to be liked? Would you recognize yourself if you saw yourself as others see you? Have you ‘come into your own’? How will you know when you do? What efforts are you making to honour your ‘wild nature’? How will/do you make contact with your crowd/mob – those with the same wild nature as you? What are you holding out for, and are you doing it with grace? Were you the wild swan in your family of domesticated ducks? Or were you the domesticated one in a wild family? How was your difference tolerated, or not tolerated? What expectations were there in your family that you would behave in a certain way? How were you supposed to turn out? Have there been times, long ago or recently, when you “can’t do anything right. Try to make it better and make it worse instead”? Are you trying too hard to fit in when you would rather just be yourself? Are you fraternizing with “uncombed cats and cross-eyed hens”? Who are the wild, strong women/men in your life? What characteristics do you value in your friends? Who are your las todas madres? Who has nurtured you besides your own mother? What are you holding on, holding out for? What is your soul yearning for?